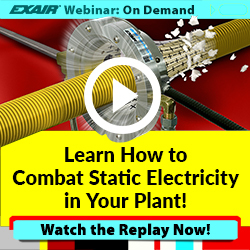 The question comes up quite a bit around this time of year as to why an EXAIR Static Eliminator is better than using a passive static eliminator to eliminate the static. 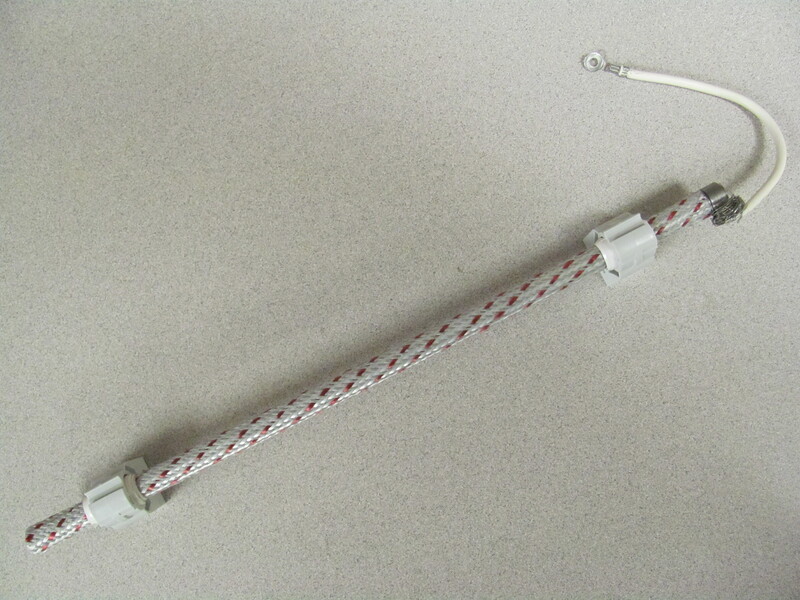 To further the explanation of a passive static eliminator, it is typically called static tinsel and is found in a variety of forms. Passive eliminators are grounded wire or strap and must come in contact with the surface of a part in order to dissipate the static charge on only that surface. This is generally found in the form of a bare wire or some type of conductive material (copper) that is strung across the path of your parts and must come into contact with the surface of your part. A conductive material bar is shown below. In order for this to eliminate the static on the part you must have the fabric actually contact the surface of your part. There are several points that this can cause an issue, the first being this item drags across the surface of your product which can wear the conductive fibers down leading to the eliminators needing to be replaced. Second, if you have a delicate, printed, or high gloss surface, you may not want anything to touch the surface and risk a blemish. Third, these can collect dirt and debris which may become transferred to the product. Last, complicated shapes cannot easily be met with the passive static eliminators, these are only going to work well with flat surfaces. 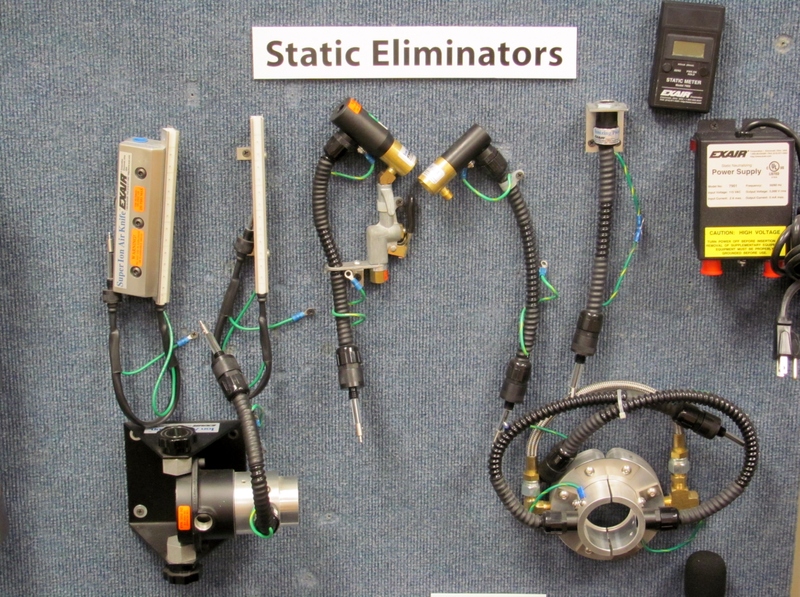 Active static eliminators, such as the Static Eliminators Product Line from EXAIR offers a variety of ways to actively eliminate the static on a surface without ever touching the product. These are ideal for delicate surfaces, painted surfaces, complicated shapes, or even flat sheets. The EXAIR line is available with or without compressed air assist which will not only utilize your compressed air efficiently while eliminating a static charge but also blow the debris or particulate off the part. Units without compressed air operation can eliminate static charges up to 2″ away from a surface while a unit with compressed air will eliminate static up to 20′ away. Because the units do not contact the parts there is no need for being concerned about contamination being transferred to the part, the eliminators will not wear down from dragging across a part or surface. 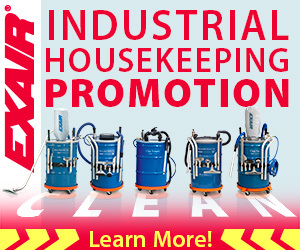 EXAIR static eliminators are also low maintenance products. To top it all off EXAIR will honor a 30 day guarantee to test the products in your facility. As well as honor a 5 year built to last warranty on compressed air products and a 1 year warranty on any electrical component. If you would like to eliminate your static problems, contact us.